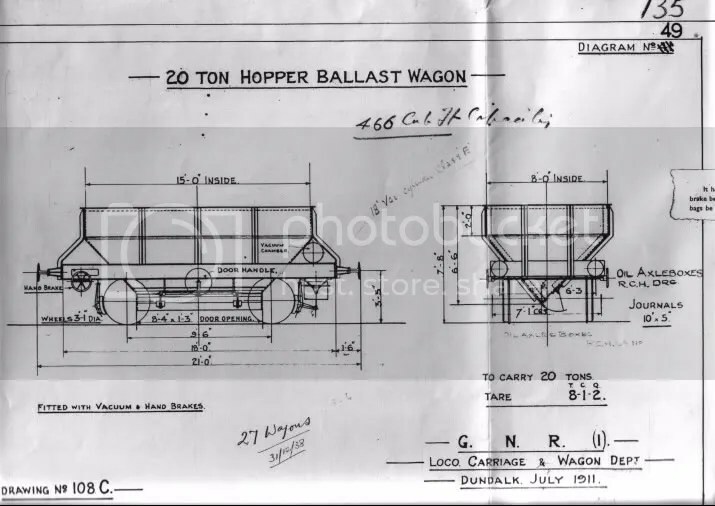 Until the end of the 19th century, the typical ballast wagon was a primitive short wheelbase vehicle, with low drop sides, leather flaps to try and keep the stone dust out of the grease-axle boxes and, possibly still, dumb-buffers. 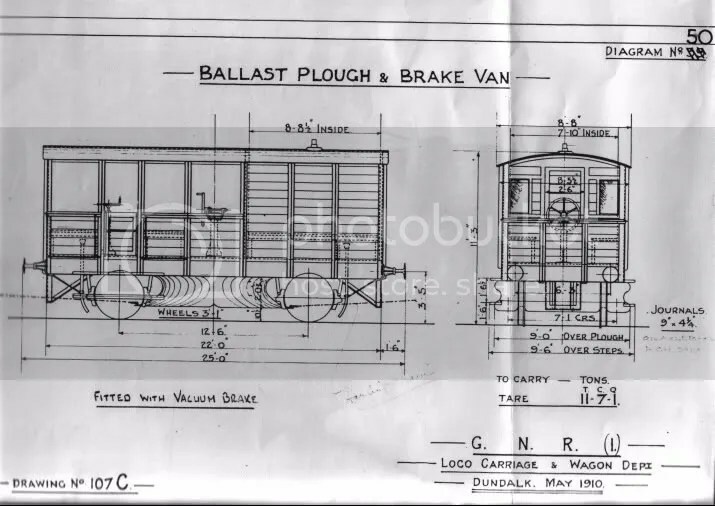 To go with these, there might be a “ballast brake van,” often derived from an even older four-wheel coach, and sometimes a sort of combined tool shed and mess hut on wheels. 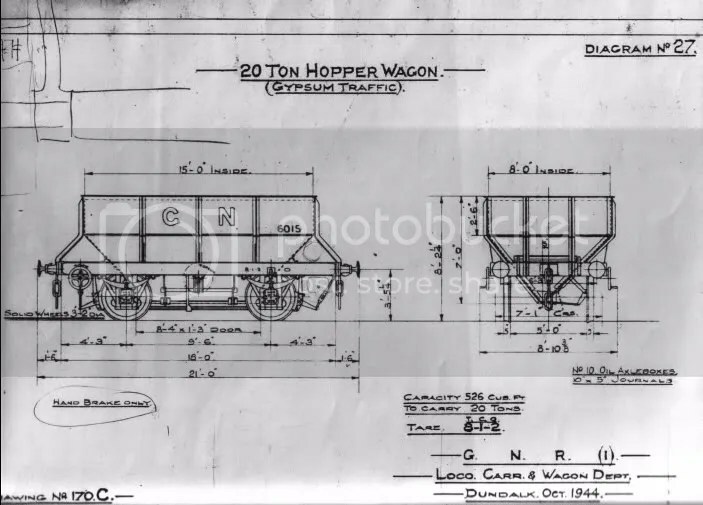 But, from the 1890’s, a number of companies, including in Ireland, the GSWR, MGWR and GNR(I), started to modernise their permanent way stock, introducing higher capacity steel hoppers, where instead of shovelling the ballast out of low-side wagons, it could be deposited directly onto the track through bottom doors, and also “plough vans” with steel shears underneath, which at least started the process of distributing the gravel. These drawings show the GNR designs of the period, and a very similar, but later, design for gypsum traffic. The plough vans and eighteen hoppers came from Hurst Neilson & Co. of Motherwell, and were of all-steel construction. The ballast wagons had self-discharging hoppers, which could be operated by screw mechanisms from either side. The van had double plough-shears between the wheels, so it could operate running in either direction, a large veranda and a covered portion with stove and lockers. All this stock had vacuum and hand brakes, and oil axle-boxes. An unusual, and it seems only experimental change was the use of “GNR(I)” lettering, instead of the more usual “GNR” and later “GN,” although since this only appears on the Neilson maker’s photos, it may have been their whim, and rapidly replaced by the orthodox legend on arrival at Dundalk. Similarly, although the posed official shot shows the van running as number 120, the GNR drawing lists them as 8166 and 8167, both built in 1910, and costing £242 each. Similarly, the Neilson hoppers, all built in 1910 at £138 each, had running numbers 8097-8114. Another nine hoppers came from Pickering in 1912, at £149 each, running as 8139-8147. 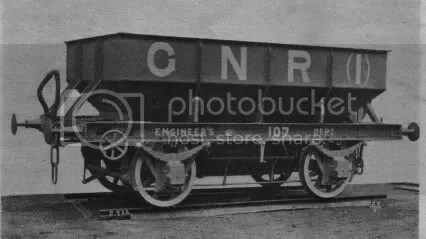 GNR(I) Ballast Plough & Brake Van. 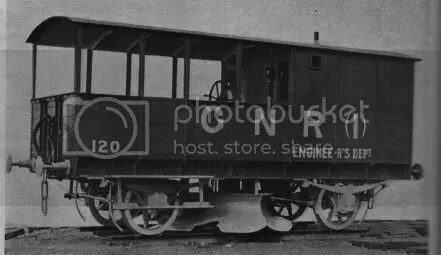 Reference: Anonymous (1911) New Rolling stock. Great Northern Ry. (Ireland) The Locomotive Magazine & Railway Carriage & Wagon Review 17: 22 (January 14, 1911). I am grateful to the IRRS archives and Mr Brendan Pender for access to the GNR drawings and permission to reproduce them. I want to say thanks for putting this together. My dad spent many a long hour in those brakevans, and i feel closer to him when I read about them. One thing that strikes me is that 100 years or from the design described, irish rail’s ballest technology has not moved-on all that much. Living as I do on the Dublin Cork line I have noticed new rolling stock in the last week!